Great for any business. Use it for multiple tasks. Move tools. products around with little effort. 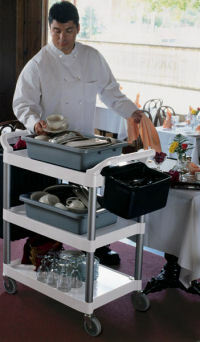 Stylish utility cart with metal uprights and large 4" casters holds up to 200lbs.Ideal for restaurants, hotels,& caterers who need a durable transport utility cart. 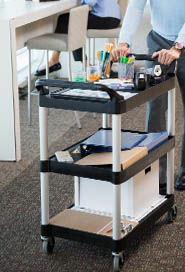 -Versatile, durable carts perform a wide variety of tasks. -Shelves have slight lip on three sides; one flat side for easy loading. -Molded shelvies will not rust, dent, or require painting. -Convenient handles and compact size enhance maneuverability. 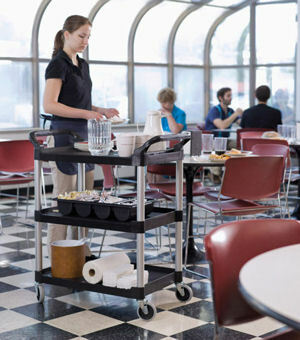 -Non-marking swivel casters reduce touch-up cleaning. -Use as desert carts for parties and weddings.